The state IT Minister KTR made the rapprochement for many development programs worth Rs. 2 billion crores across Khammam district on monday.Tummala Nageswara Rao, Indrakash Reddy, members of Khammam MP Ponguleti Srinivasa Reddy and Khammam legislator Puvvada Ajay Kumar participated in the meeting. Earlier he started the constituency building built in Khammam. Later, the statue of Telangana mother started. Later the building was laid off. Speaking on the occasion, Ketiar said that Telangana is the only state in which the power supply is free of farmers. The government has been awarded with a pension grant of Rs 1,000 a month for forty two lakh people. About Rs 4,000 crore has been allocated for pension. In Telangana, Chief Minister K Chandrasekhar Rao is a golden age. After the announcement of Khammam town as corporation, he said that many development programs have been initiated. The government has sanctioned Rs.100 crore for Khammam Urban Development and has taken various development programs. "We are building a Wage and Non Wez market in the city of Khammam at a cost of Rs 10 crore. If the market starts, the people of Khammam will experience vegetables. The Telangana government has constructed the new municipal corporation building with modern facilities with a budget of Rs 14 crore in Khammam, aiming to provide public services to all people. The minister assured the government that the government was working on the well-being of the people. The Amrut scheme in Khammam municipal corporation has been linked to Mission Bhagiratha scheme and announced a mega water project of Rs. The government has set up a scheme to provide good water supply for the city's population for thirty years. 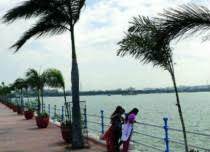 It is said that the cost of Rs.25 crores has been improved for the Khammam people to be a delightful pond. Dudu Bedroom houses are being provided to the poor by the government in the Shivaguddu in Khammam.